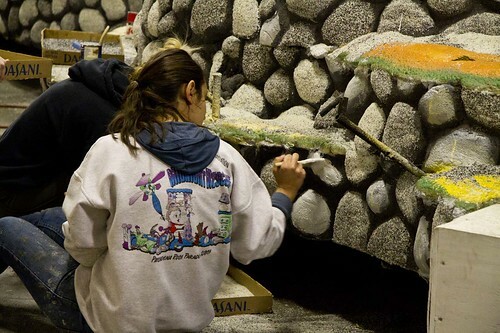 "A stroll down memory lane" is the theme for this years' Downey Rose Parade float. Tonight we visited the float barn to see the float for our first time. It was pretty amazing. 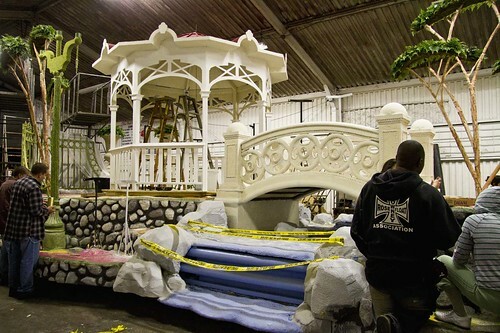 This years float has a giant gazebo, water fountain, bridge (with a pond), and stone wall. It was fun to watch volunteers gluing dried peas and seeds to the surfaces. Although the Rose Parade has been a California tradition since 1890, Downey's first recorded entry was 1913. And, Downey is one of the few communities that still builds its own float with volunteers. It's down to the finishing touches. Right now the flowers are soaking up as much water as possible. 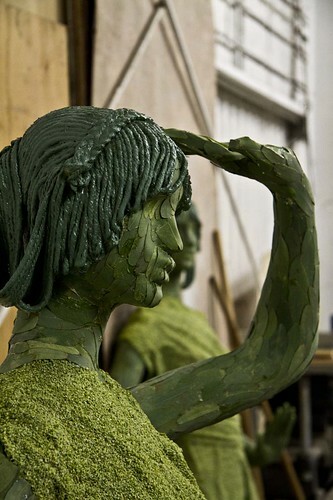 Tomorrow it will be time to start putting the flowers on the float. I think there will need to be more pictures to follow. I need to also mention, this is our one year anniversary for Downey Daily Photos. We made it! We posted every day for a year. Happy anniversary! That is an impressive float!